On Homecoming night, the winless Ruskin Golden Eagles nearly extended the celebration to their home turf. But the Truman Patriots, also winless coming in, proved to be too much as they pulled away in the fourth quarter for a 35-15 victory. The final score belies what was a compelling contest for more than three quarters, despite the fact that Ruskin head coach was forced to miss the contest due to personal reasons. The Patriots kicked off the scoring with an early 26 yard touchdown pass, although they failed to convert the extra point. Truman added to their lead on Ruskin’s ensuing possession when quarterback Kieston Burrell was called for an intentional grounding penalty inside his own end zone. With the safety, suddenly, the Patriots were up 8-0 and bracing for a Ruskin kickoff. 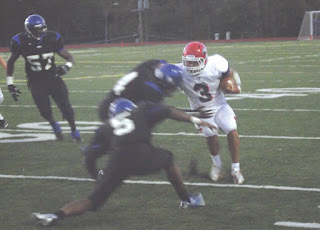 Truman took advantage of the opportunity, as star running back Demetric Dinwiddie moved the ball effectively against the Eagle defense on the ensuing drive. The Eagles marched right down the field for an eventual one-yard touchdown plunge from quarterback Alex Ryan. Before the first quarter had elapsed, the Eagles were down 15-0. Ruskin, meanwhile, looked sluggish offensively to begin the game. Punter Kaymonn Lunn was an active participant in the first half. Fortunately for Ruskin, though, Lunn (also a punt returner, wide receiver, and defensive back) would utilize his wide skill set to close the gap before halftime. With hope waning, Lunn turned the game around with 3:20 left in the second quarter with an improbable, momentum-shifting 89 yard punt return for a touchdown. Lunn caught the punt on the right hash, veered left, and jetted down the left sideline for Ruskin’s first score of the game. With 8:33 left in the third quarter, Lunn struck again. This time, it was on a 26 yard touchdown pass from Burrell. Burrell threw a deep out pattern near the left sideline, and Lunn hauled the ball in over his shoulder as he crossed the end zone barrier. After Burrell charged into the end zone for the two-point conversion, the game was tied 15-15. That’s how the score remained until Dinwiddie seized control early in the fourth quarter. The dynamic running back, who had shown flashes of elite speed all game, finally broke out with a 56 yard touchdown to begin the quarter. From there, it was all Dinwiddie. The tailback added touchdown runs of 27 and 6 yards to put the feisty Eagles away, and Truman handed Ruskin their sixth consecutive defeat to begin the season. The Eagles play an away game next against the Oak Park Northmen, who are also winless on the season.